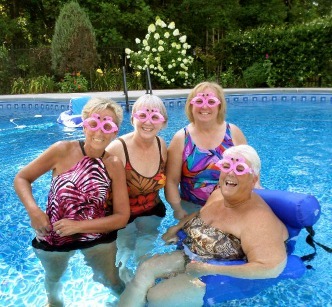 A high school reunion and milestone birthday prompted this Girls Pool Party. Friends flew in from California, Colorado and Wisconsin for a weekend of flamingling. 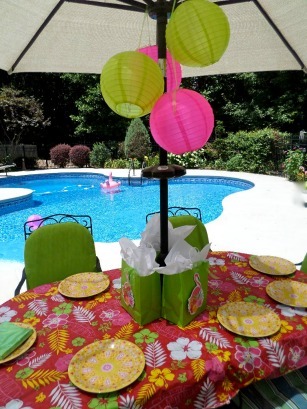 I found these cute pink and green invites at Etsy which set the theme and colors for our girls pool party. 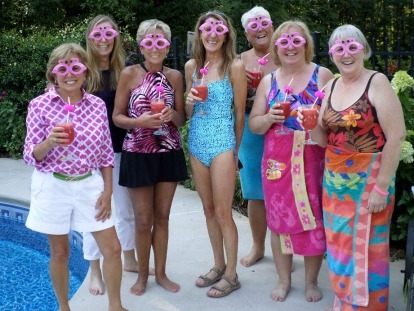 As the guests arrived they donned their Foam flamingo glasses and hot pink flower leis and the weekend of fun began. 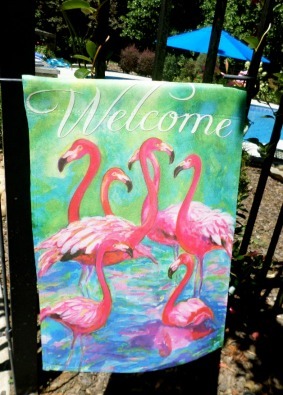 A colorful flamingo flag - with the design on both sides - greeted guests by the pool gate. 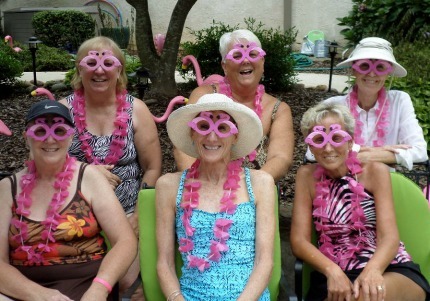 Set out several pink inflatable flamingos - by the pool, the party table, steps, or pool entrance. These are nice and large - 28". I love to decorate with inflatables since they can get wet and when they end up in the pool - which they often do - it just adds to the fun. 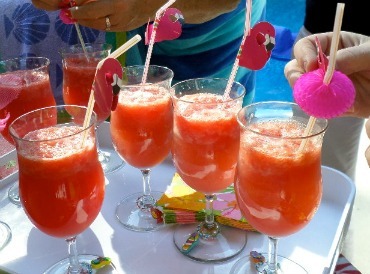 Flamingo Straws and tropical wine charms added a festive touch to the watermelon cooler drink. I juiced a whole water melon in my Vitamix and then froze it. Just put a big scoop of frozen watermelon in each glass, poured in some Sprite and for those who wanted it a bit of lime liquer. So refreshing! I loved the colors in this tropical umbrella tablecloth. It fit with our fun theme and color scheme. There is a hole that accommodates the umbrella pole and it has velco strips to close it. The party favor bags are used as centerpieces. I now only use nylon lanterns, rather than paper lanterns. They don't wilt in the humidity and water won't hurt them. 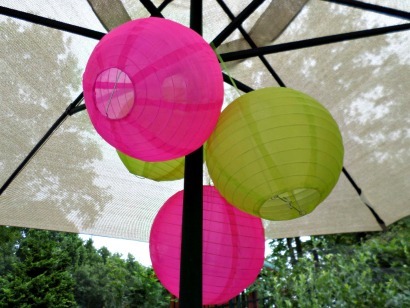 For five days we kept these pink and lime green lanterns up and they still looked great - ready for the next party. I purchased 14" Hot Pink Nylon Lantern and 14" Apple Green Nylon Lanterns. The 14" size was just right for 4 of them strung up and around the ribs of the umbrella. 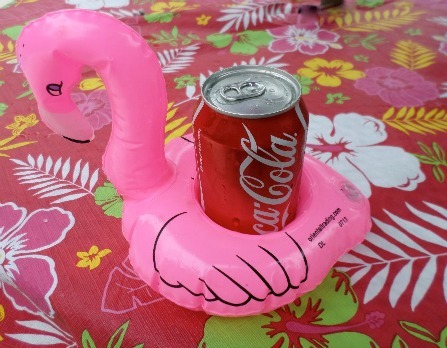 Everyone got their own pink flamingo coaster. They kept drinks a bit cooler and although they float - I wouldn't count on them not tipping. Ask me how I know :) But they sure looked cute on the table. 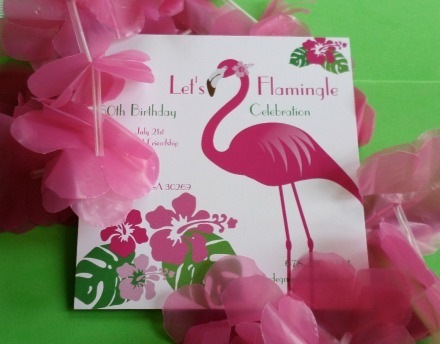 I wish I would have found these flamingo luminary bags in time for my party. If the timing of your celebration will be in the evening hours, surprise everyone with these luminary bags. The cut-out bags, like these are my favorite. You can really see the cut flamingo shape when the bag is lit up. Use cheap electronic tea lights and decorative rocks for added weight. 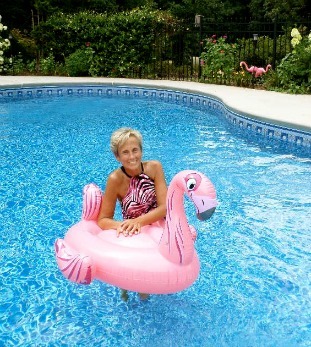 Who could resist this flamingo float? I couldn't. The floats were bought at Publix at the end of summer. 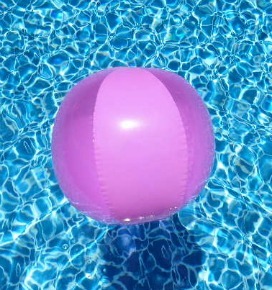 This float is even better than the one I bought because of the deep pink vibrant color and the fact that it inflates to over 4 feet. 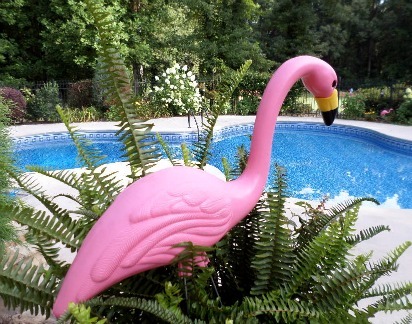 Thick and durably vinyl, the flamingo head stands high - 5 feet actually. So if you want an instant pool decoration float this is the one. Floating chairs like this one meant that the chatter didn't stop when we got into the pool. 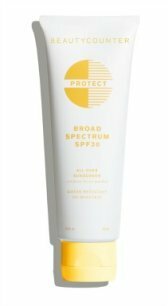 I bought several of them from Amazon (we took them to the ocean as floats and loved using them there too). 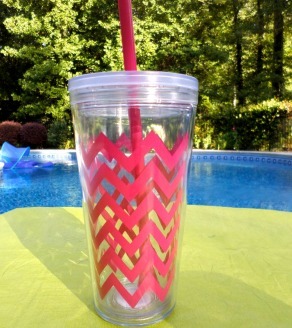 Everyone received a gift of an insulated tumbler with a straw in their party bag. With each design being unique everyone knew which glass was theirs for the weekend. 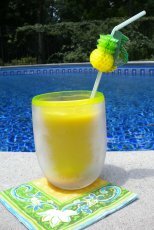 It is a nice size - 24 oz - keeps drinks cold without sweating. 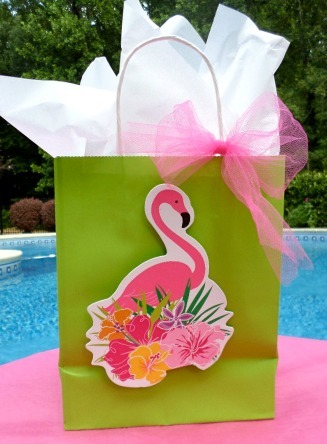 Lime green party bags are adorned with some pink toulle and flamingos. The flamingos are actually centerpieces and I just cut off the honeycomb portion. You can still find them at Birthday Direct - 3 for $1.87. 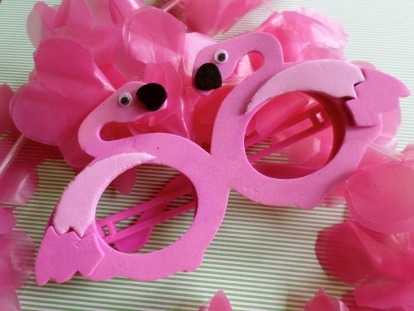 OK, not pink - fuchsia cupcake wrappers topped by pink flamingo finger puppets ended our meal - but not our fun. Running out of time, I ordered the cupcakes from Publix - white cake and white frosting. Can I tell you they were the best cupcakes! So moist, light and fluffy and the frosting was tasty - just right not too sweet. 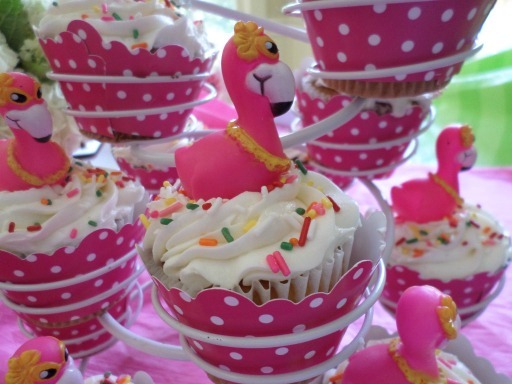 Embellish with some colorful sprinkles and display them in a cupcake tower. 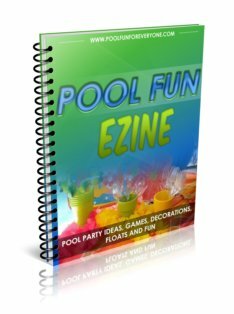 So if you are planning a girls pool party find out how much fun it is to flamingle with your girl friends with this pool party theme.